This page showcases Zap Calendar Lite, the free version of Zap Calendar. 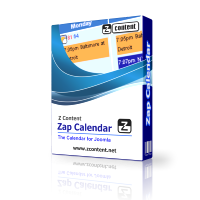 Zap Calendar Lite provides a native calendar for your Joomla site with advanced editing features not found in other paid calendar products. You can easily upgrade to a paid Zap Calendar subscription with additional features at a later time without losing any calendar data you have created using the Lite version.